’Tis the season for celebration, and you can’t beat a holiday breakfast to bring family and friends together. Pear-Cranberry Crepes make an elegant touch to a Christmas morning celebration and burst with an abundance of fruity flavor. 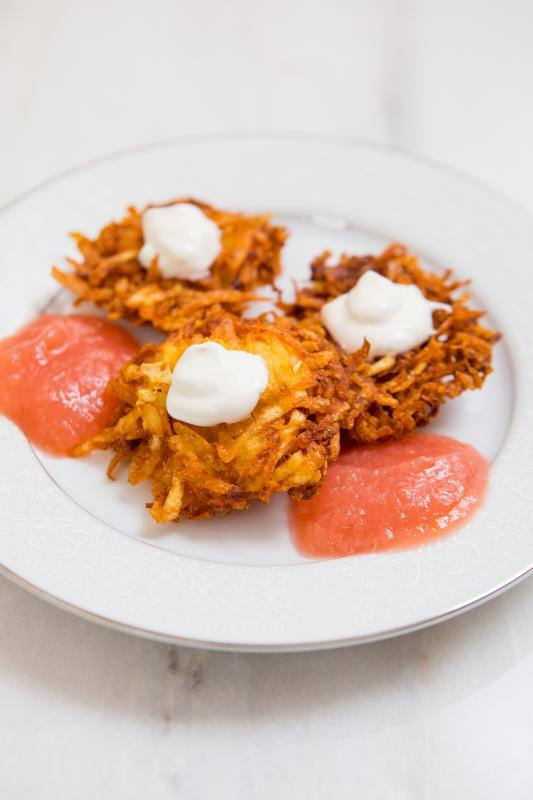 Let Latkes, traditionally served at Hanukkah, star on the breakfast buffet. What could make an Eggs Benedict any better? 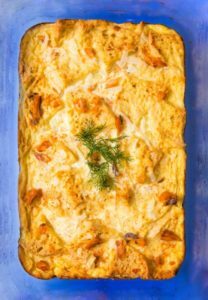 Our twist on the classic for a New Year’s Day breakfast adds the flavors of smoked salmon or lox to a casserole made for easy entertaining. Finally, toast to a happy holiday season with a lively morning libation: Golden Fruit Punch. 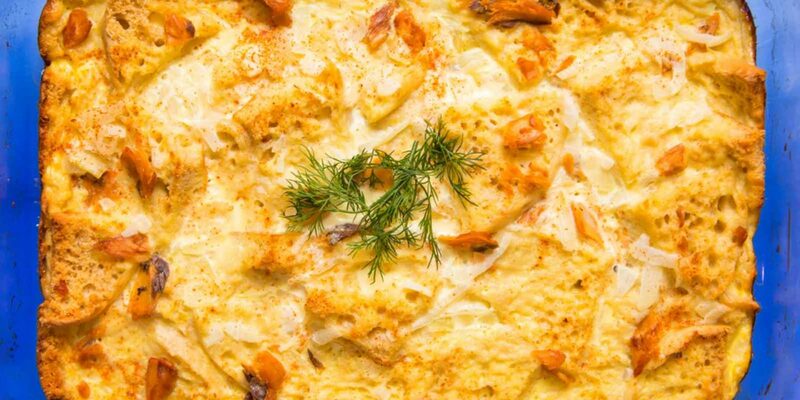 This dish brings together the best of Eggs Benedict in a casserole that serves a crowd. 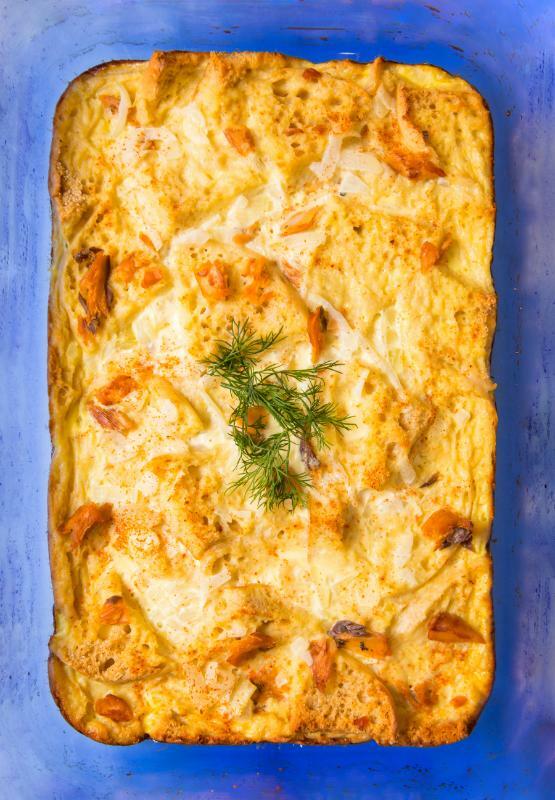 Place half of the smoked salmon or lox in a buttered 9-by-13-inch baking dish. Top with English muffins and remaining salmon. In a large bowl, whisk together the eggs, milk and onion; pour egg mixture over top of the English muffins in the baking dish. Cover and refrigerate overnight. Remove baking dish from the refrigerator about 30 minutes before baking. Preheat oven to 375 degrees F. Sprinkle top with paprika. Cover and bake for 35 minutes. Uncover baking dish; bake for 10 to 15 minutes longer or until a knife inserted into the center comes out clean. Serve immediately with lemon hollandaise (recipe follows). Garnish with sprigs of fresh dill (optional). Slowly whisk in the melted butter, using small portions at a time, until the hollandaise thickens. If the hollandaise becomes too thick or starts to curdle, immediately whisk in 1 to 2 tablespoons hot water. Serve the hollandaise immediately or keep it warm in a heatproof bowl set over a pan of simmering water; whisk occasionally to avoid lumps. Makes 12 servings. These potato pancakes should be fried quickly over high heat so that they don’t stick or break apart. Serve with applesauce. Grate potatoes into long strips over a large bowl of cold water, using the largest holes of a square grater. Remove the grated potatoes from water into another bowl. Pour off water from the first bowl, reserving the sediment at the bottom. Add the sediment to the grated potatoes. Add eggs and onion. Season with salt and pepper. Mix all ingredients well to combine. In a heavy-bottomed saucepan, heat about ½ to ¾ inches of oil until the oil reaches about 385 degrees F.
Drop 1 heaping tablespoonful of potato mixture into the pan. Cook until latkes are golden brown, about 3 minutes, being sure to cook only about 5 to 6 latkes per batch. Turn latkes over and cook on the other side until golden brown, about 3 minutes. To keep latkes warm until ready to serve, transfer to a baking sheet and place in a 200 degree F. oven for up to 30 minutes before serving. Makes 8 servings. Make the crepe batter: In a medium bowl, whisk together the flour and sugar; set aside. In a small mixing bowl, whisk together milk, water, oil and egg. Whisk liquid ingredients into the flour mixture. Cover and refrigerate mixture for 1 hour. In a large saucepan, combine pears, sugar, cranberries, cinnamon and nutmeg. Cook and stir pears over medium heat for 8 to 10 minutes, or until the pears are tender. Set cooked pears aside. Lightly butter an 8-inch crepe pan or skillet and place over medium heat. Pour about 3 tablespoons of crepe batter into the center of the crepe pan or skillet. Lift and tilt pan to evenly coat bottom of skillet with batter. Cook until the top of the crepe appears dry; turn and cook for about 15 seconds longer. Remove cooked crepes to a parchment-lined baking sheet. Repeat with remaining batter, adding more butter to crepe pan or skillet as needed. When cool, stack crepes with parchment paper between each crepe. Fill each crepe with about ¼ cup of pear mixture; roll up. Lightly grease a large griddle or skillet and place over medium heat. Cook crepes for about 3 minutes on each side or until crepes are lightly golden brown. 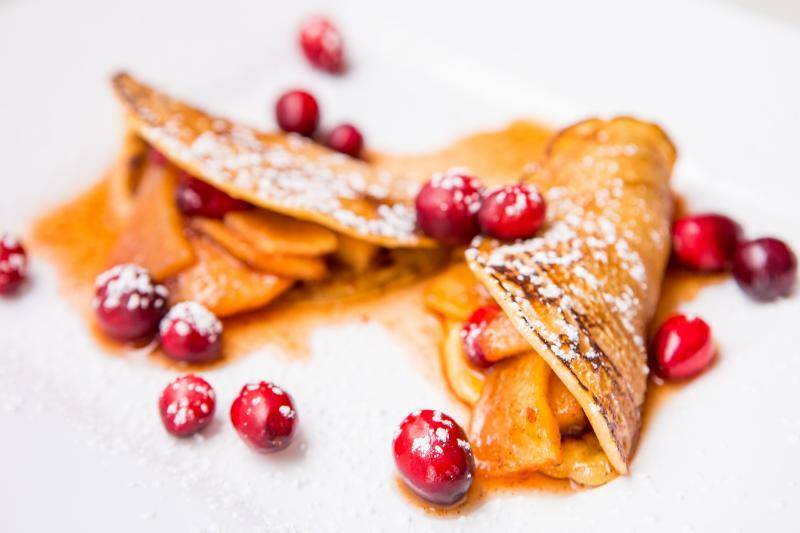 Transfer crepes to serving plates and serve with a dusting of confectioners’ sugar. Makes 1 dozen crepes. To make a nonalcoholic version of this punch, omit the Cointreau. 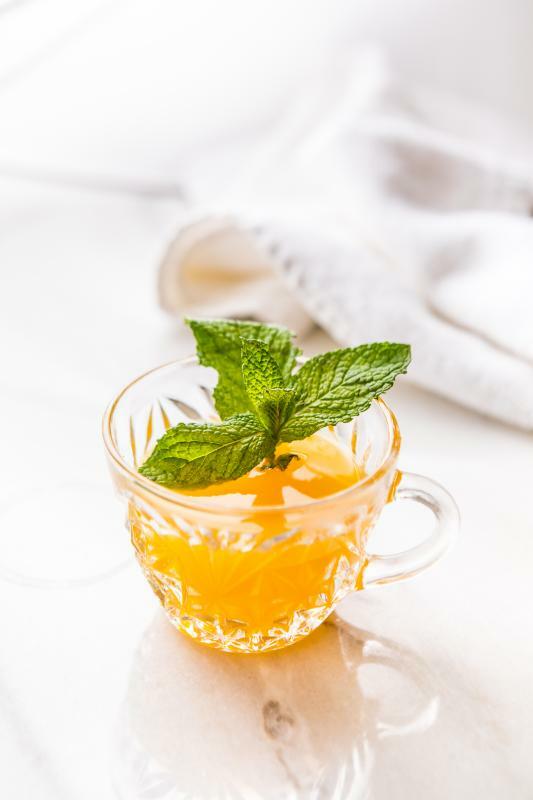 In a large saucepan over low heat, combine orange juice, mango nectar, apricot nectar, cinnamon stick and nutmeg. Cover and cook over low heat for about 2 to 3 hours. When ready to serve, remove cinnamon stick. Stir in Cointreau (if desired). Serve warm in punch cups garnished with fresh mint sprigs. Makes 12 servings.